The Rev. Al Sharpton visited rapper Meek Mill at the state correctional institution in Chester, Pa. on Monday, November 27, 2017. On the day that a scheduling glitch led people to believe that Meek Mill would have a bail-reduction hearing at a Center City courthouse, the rapper facing two-to-four years in prison for violating parole hosted a high-profile guest behind bars. Just after 2:30 p.m. Monday, the Rev. Al Sharpton emerged from an SUV with New York tags outside the State Correctional Institution in Chester, crossed the street and entered the lobby. “Trying to find a way out,” was all that the normally gregarious civil-rights activist said before the phalanx of news cameras awaiting his arrival. He didn’t break stride as he crossed the street before entering a building on his way to meet with the 30-year-old rapper. Mill, born Robert Rihmeek Williams, was unexpectedly (to some) sent back to prison on probation violations stemming from a nearly decade old gun-and-drugs case, despite prosecutors’ recommendations to the contrary. Common Pleas Judge Genece Brinkley, who cited a pair of arrests this year and illegal dirt-bike stunts in making the decision, has been the target of much criticism from those who think her sentence was unfair. While he was mum before entering SCI Chester – located in the shadows of a Harrah’s Casino parking garage – he was anything but when he exited the building more than two hours later. 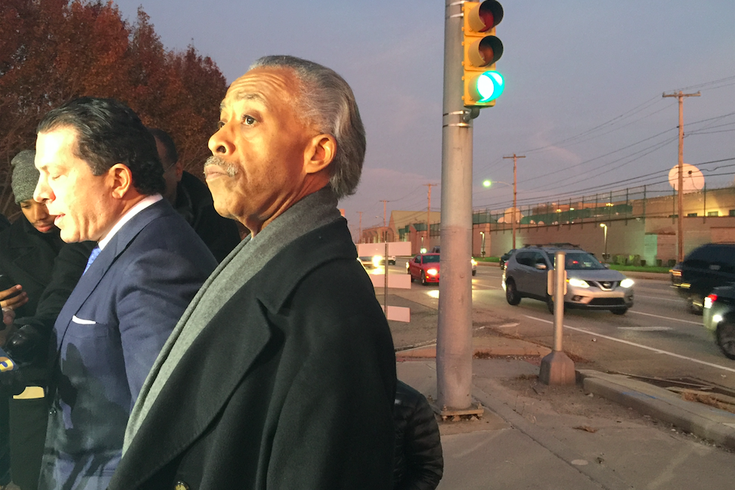 Prison personnel politely moved the media scrum off commonwealth property, so Sharpton and Mill’s attorney, Joe Tacopina, fielded questions for about 15 minutes just steps away from traffic on a busy, rush-hour roadway. “Meek represents thousands of people in Pennsylvania and tens of thousands across the country who’ve been victimized by an abusive probationary and parole system that can move a judge to act way beyond what is necessary, what is palpable and, in my judgment, what is ethical, to throw people’s lives away,” Sharpton said. “He’s representative of many people in institutions like this that do little or nothing, they’re violated and then their lives, their businesses ruined,” he continued. “If you can do this to a successful artist like Meek Mill, you can do this to many around the country. Tacopina noted that he’s filed a motion to reconsider and recuse. “She [Brinkley] cannot be a just and impartial arbitrator of the facts of the case, and certainly of this defendant,” he said, noting that if they don’t get a response by December 5, they’re free to pursue action in higher court.